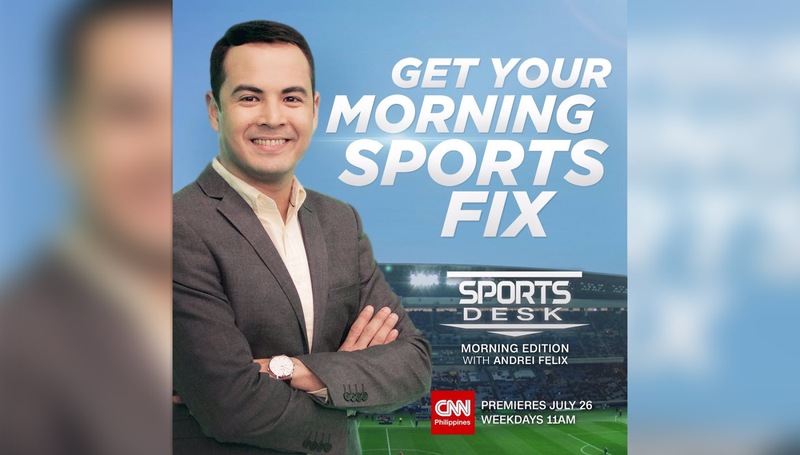 CNN Philippines is adding another edition of its flagship sports program, Sports Desk, beginning Tuesday, July 26. The program, scheduled to air at 11AM, will be anchored by New Day's Andrei Felix. "Aside from still being part of the morning show, and to be given this privilege to host the morning edition of Sports Desk on my own, I can sincerely say that the Lord has truly answered my prayers," he says in an interview with Media Newser Philippines. "And of course, I'd also like to thank Ms. Armie Jarin-Bennett and Sir Pal Marquez, and the whole CNN Philippines management for this wonderful and awesome opportunity." Like its primetime editions, both of which are currently being anchored by Mico Halili, Sports Desk morning edition will be a half-hour program delving into the world of sports. "I am just really excited to deliver all the news, info and tidbits about everything and anything related to sports, both local and foreign," says Felix, who also promises that the program will be upbeat, fun, and interactive. "I will also get to interview and talk to different athletes, celebrities and personalities related to sports, which in my opinion, is a universal language." Felix, who was formerly a Kapamilya before joining CNN Philippines earlier this year, will remain part of New Day even as he begins anchoring his new program. "I am still just so overwhelmed with all the blessings I've been showered with this year, especially since becoming part of CNN Philippines," he says. "I am also just really grateful and very honored to be in this position, wherein I am given my very own solo sports show, which has always been a dream of mine ever since I was in college. It's so surreal." Asked whether this promotion signals a move to the local CNN network full-time, Felix, who is also a sports announcer for ABS-CBN Sports, says: "For now, I can continue to cover the NCAA games. It's a great opportunity covering basketball games of the very first collegiate athletic league of our country, as it goes hand in hand with me covering all sports news on my shows on CNN Philippines. Again, I just consider everything that I've been receiving as blessings and answered prayers from God. I am just His passenger on this wonderful journey." Sports Desk with Andrei Felix will be executive produced by Kal Quiñones, along with producer Cal Del Rosario.